Is Rex About To Become An Ex? Is Rex About To Become An Ex? Is Rex About To Become An Ex? The latest team Trump personnel change rumor seeping out from the beltway is that Secretary of State Rex Tillerson’s tenure at Foggy Bottom may be on shaky ground. And based on his interview with Chris Wallace on Sunday, Tillerson may be pushing for it to happen sooner rather than later. Trump’s frustration with Tillerson includes the fact that he doesn’t have people in the top jobs at Foggy Bottom. Sources from within the beltway are that Tillerson has clashed with the president on some major policy differences. The Secretary of State was one of the major proponents for delaying the move of the U.S. Embassy in Israel to Jerusalem and against declaring Iran in violation of the nuclear deal. R.C. Hammond defends his boss saying “This admin inherited a lousy deal. 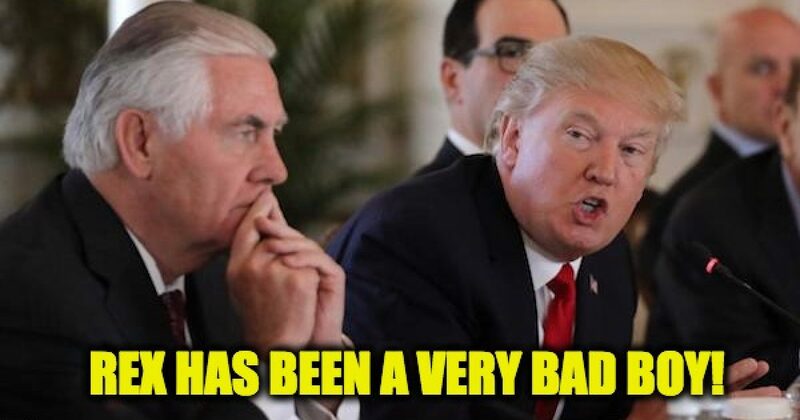 It’s taking the circumstances created by the Deal and trying to build around it a policy that addresses all of the threats Iran offers the world.” President Trump as given in to his Secretary of State twice, it will be interesting to see if the third time is the charm. Tillerson argued against the White House’s financial sanctions against the dictatorial regime in Venezuela, according to sources close to the White House. These sources pointed to the influence on Tillerson of Tom Shannon, a top State careerist who is an expert on Latin America.Sources close to the president view Shannon as a rogue force who, in their view, naively puts too much faith in diplomacy at the expense of hardline actions like sanctions. Shannon’s recent meeting with Venezuela’s then-foreign minister — at the same time the WH was contemplating tough action against Venezuela — raised eyebrows among Republican hawks. Perhaps the Secretary of State is looking to lose his job. Tillerson was interviewed by Chris Wallace on the latest edition of Fox News Sunday and he seemed to toss his boss under the bus when asked about the President’s reaction to Charlottesville. President Trump: The only people giving a platform to these hate groups is the media itself and the fake news. Wallace: Does that make it harder for you to push American values around the world when some foreign leaders question president’s values? Tillerson: Chris, we express America’s values from the State Department. We represent the American people. We represent America’s values, our commitment to freedom, our commitment to equal treatment to people the world over. And that message has never changed. Wallace: And when the president gets into the kind of controversy he does and the U.N. committee response the way it does, it seems to say they begin to doubt are — whether we’re living those values. Tillerson: I don’t believe anyone doubts the American people’s values or the commitment of the American government or the government’s agencies to advancing those values and defending those values. Wallace: And the president’s values? Wallace: Are you separating yourself from that, sir? YIKES! That does not sound like a guy who wants to keep his job. The rumor is that if Tillerson leaves (or is pushed overboard) U.N. Ambassador Niki Haley will be taking his job. But even if he is on “thin ice” don’t look for that to happen in the short term. On Monday (today) Tillerson is having lunch with the POTUS and the Vice-POTUS, how I would love to have a bug under the table of that conversation (along with the giant bag of popcorn).